I liked the breakdown this morning of the zone blitz package and it reminded me of something I've been thinking about since listening to Mattison's press conference yesterday. In talking about ND's last TD, he said they were trying to disguise their 3-deep zone coverage by having everyone at the line. He said the play was not executed properly, which I assume means Marvin Robinson did not get back into his middle third deep zone quickly enough. 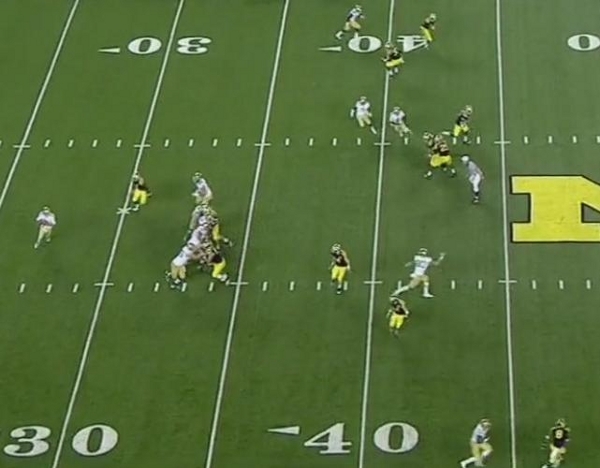 Mattison also mentioned that this coverage was the same coverage that he called on Kovacs INT. 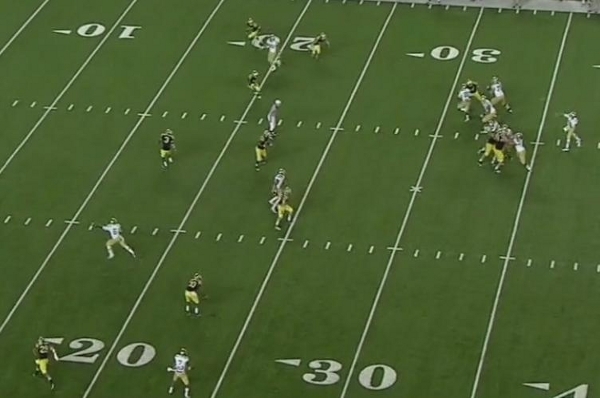 On the Kovacs INT, ND still had a receiver wide open in the seam for a long TD if Rees sees him. My question - would it be fair to call this defensive coverage "unsound"? I can't figure out how the coverage is supposed to look like without there being a gaping hole somewhere downfield with our pre-snap alignment (with the DBs being close to the line). While he gives us some hints as to what the playcalls are on the Kovacs interception and Notre Dame's final touchdown, I think the more telling comment is when he says that the team really needs to not bust the coverage because on both of the plays, Michigan blew their coverage pretty badly, directly leading to the touchdown and what could have been another if Tommy Rees wasn't intent on forcing the ball to Michael Floyd. The design of both plays, however, couldn't be more basic: Michigan is running a simple cover-3 with five underneath defenders in zone (the diagram may look cluttered, but the actual execution is simple). 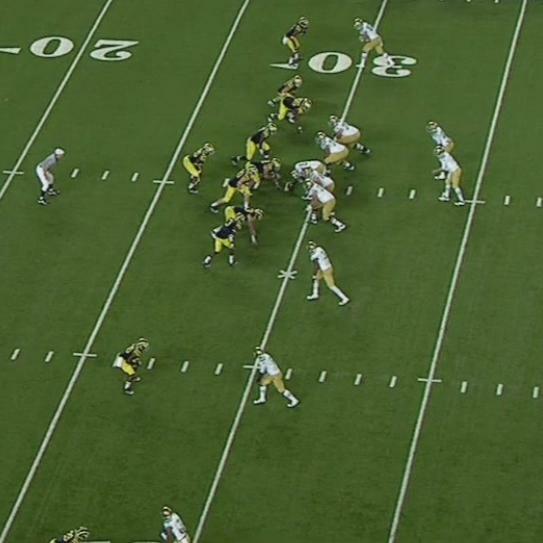 Here, Notre Dame is in a 5-wide set. 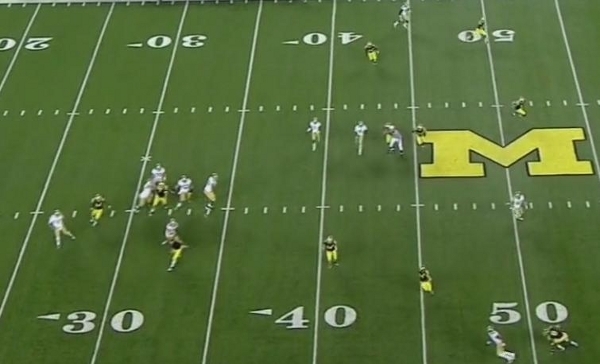 Michigan is showing an aggressive man defense with no safety help over the top. 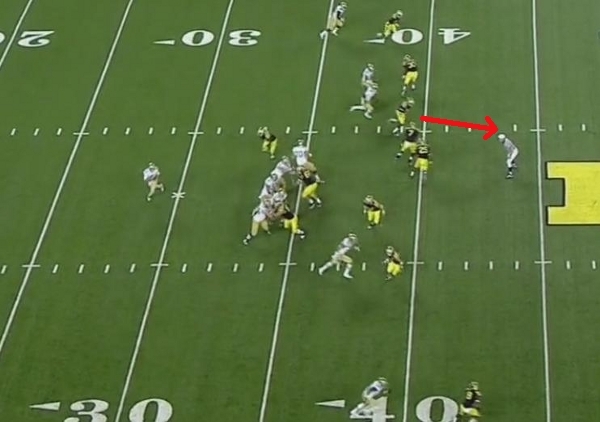 On the snap, you can see Michigan's three down linemen rush while everyone else drops into coverage. Marvin Robinson (on the hash at the top of the screen), turns his head toward the middle of the field and begins to sprint toward his zone in the deep middle of the field. As we'll see in a bit, this is problematic. A moment later Robinson is hauling from his presnap position to cover the deep middle of the field. Floyd and Avery are also running downfield to cover their respective deep third. Now Robinson has identified the Notre Dame receiver running the seam route and is trying to get over in coverage. He still hasn't looked behind him to see what the strongside receivers are doing. For what it's worth, I believe that it's either Kovacs' or Jake Ryan's responsibility here to re-route the seam route to the outside where JT Floyd can pick up deep coverage. 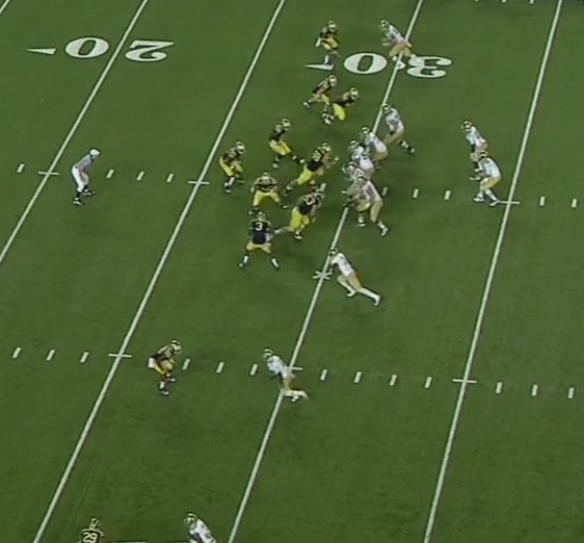 When they don't, the Notre Dame receiver has a clear lane to the endzone. This is how the play fortuitously ends: with Tommy Rees throwing into bracketed coverage on Floyd. Robinson, meanwhile, is on the opposite hash from a Notre Dame receiver streaking down the field and he never once looked to the strongside of the field. In this instance, Robinson identified the Notre Dame receiver running down the seam and did his best to get into position. Had Ryan or Kovacs pushed the seam route outside, Floyd would be able to show coverage and hinder a throw while Robinson gets into position. In addition, the underneath coverage is terrible. Demens and Hawthorne are falling over one another (this is Hawthorne's fault), leaving gaping holes in the coverage. 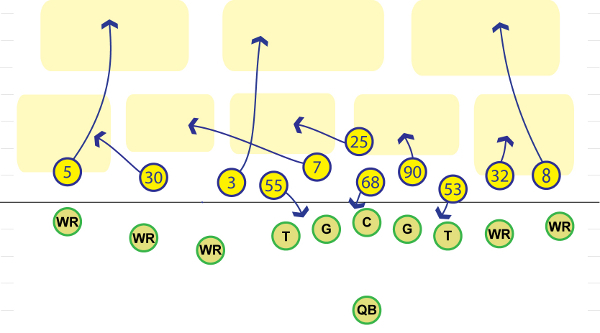 Next up, let's look at the formation for the Notre Dame's late touchdown. 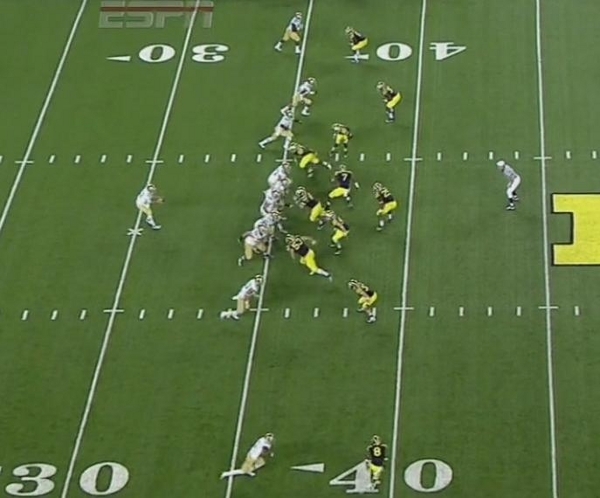 As you can see, Michigan is in the same presnap formation. Woolfolk is on the field for Avery, and Ryan and Brandin Hawthorne have been flipped, as have Jibreel Black and Van Bergen. On this play, it's obvious what goes wrong: Marvin Robinson. More interestingly, as the play progresses, you can see that Robinson remembered the Notre Dame slot receiver running free down the seam from Kovacs' interception. Here, Robinson is at the end of the line of scrimmage just outside of Ryan Van Bergen (bottom of screen). As the ball is snapped, you can see what went wrong: once again, Robinson turns his back to the strongside of the field. He's responsible for the deep middle but never turns his head around to see what's happening behind him. He's expecting there to be a weakside seam route. Robinson has turned to run to his zone and still can't see the three receivers on the strongside of the field. He still can't see the receivers on the bottom of the screen. In the shot below, his head is actually turned to the weakside of the field trying to identify the weakside vertical route (it never materializes). As Rees throws the ball, you can once again see the back of Robinson's jersey. You can also see Notre Dame's wide receiver literally hand-wavingly open. What happened here was simple: Robinson, a young player who hasn't had much playing time, has no clue where he's supposed to be looking and missed his coverage. However, one reason he missed the coverage was because of a nearly identical play that Notre Dame ran early in the game that should've punished the defense. There are a few positives from this play. 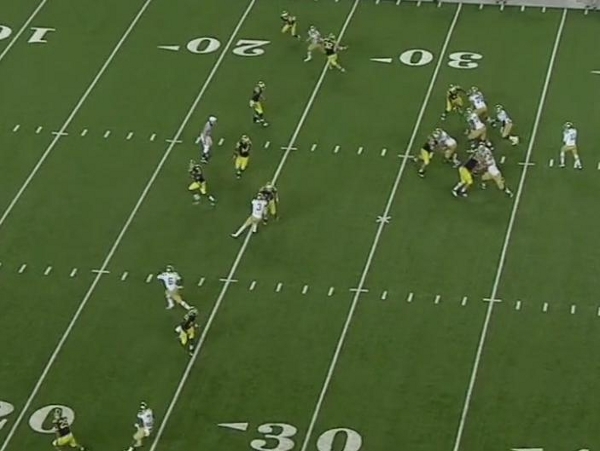 First, if you look at Notre Dame's other receivers, they are all blanketed in coverage. The underneath coverage is miles better than it was on Kovacs' interception. Michael Floyd, settling into underneath zone in the middle of the field is bracketed, as are the two outside receivers. Thomas Gordon is even in a position to bait Rees into making a long throw to the outside, much like Kovacs did. Underneath, this is textbook coverage. Robinson, meanwhile, is completely lost in space and not covering anyone. The worst case scenario here, if it's executed correctly, is that Robinson is one-on-one with a Notre Dame receiver for a jumpball. Just as importantly, Robinson is actually further down the field than the ND receiver, meaning were he to get his head around correctly and cover his zone, he would be in good position to make a play on the ball. He wasn't beaten over the top with speed, just mental errors. One thing we learn here is that multiple vertical routes are difficult to cover from this presnap formation. 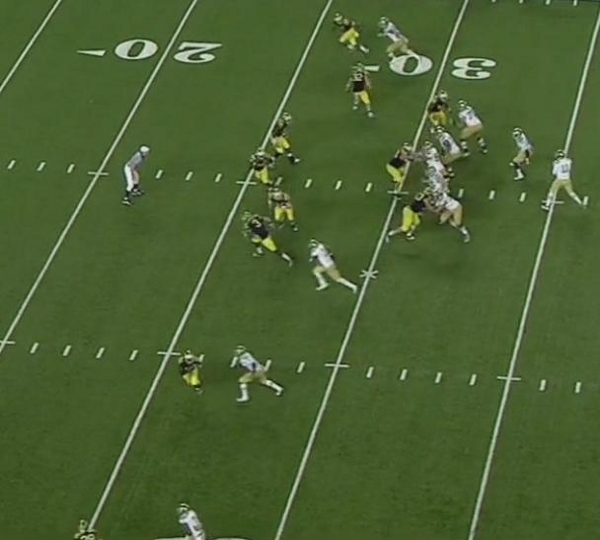 Michigan essentially gambled that either a) Notre Dame wasn't running any vertical routes or b) Robinson was lined up on the proper side of the field and able to cover any seam routes. Though he was on the proper side of the field on this play, Robinson was too anxious to cover the weakside receiver(s) and gave up the strongside TD pass. 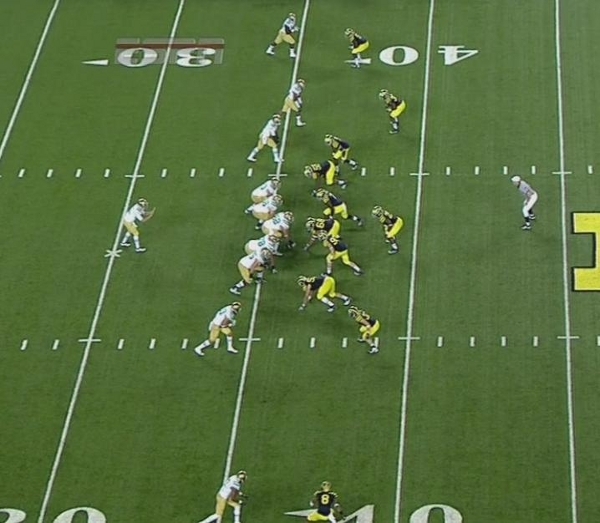 Ultimately, I think it's unfair to call this defensive alignment or playcalling unsound. While Michigan escaped on Kovacs' interception, the fundamental errors actually came back to hurt Michigan on the fourth-quarter touchdown. With more time in the defensive system, we can expect more positive than negative plays from presnap formations like this and avoid the hand-wavingly open receivers screaming downfield. Man, I just don't know. The only way Robinson can see that seam route from his pre-snap alignment is to flip his hips to the near sideline, turning his back entirely away from the qb. Now, maybe he's supposed to do that, given the strength of the formation, but that's risky too, as you are now asking for a deep crossing route all in your face. I think this is a play that an experienced, fast free safety can pull off, or can work if the qb's confused. We don't have the former and as for the latter, we fooled him once, he didn't get fooled again. I think besides Robinson overcompensating, the big difference is that there are 5 wideouts in the first formation and only 4 in the second formation, with only one on the weak side. The defense is much more likely to get outnumbered on the strong side and he should err in that direction in his coverage. Great breakdown, I think Robinson was remembering his last non-fatal mistake and got caught frantically searching for a receiver who was never there, since the running back was in next to the QB. I think there is a general learning curve for the entire defense in reading the offensive formation and figuring out where to be. Many plays against EMU the DL was running around and not set before the snap. If that formation is run correctly the streaking seam route is bracketed by Woolfolk and Robinson. 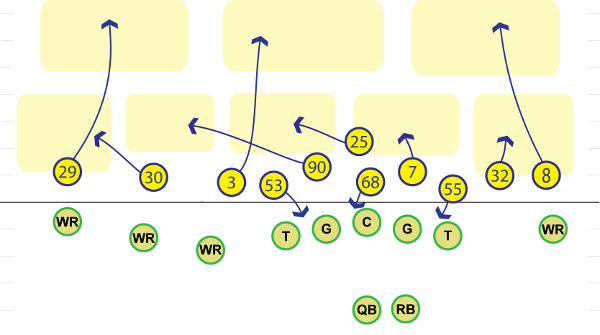 Robinson should have counted the receivers and started his scanning on the weakside of the formation. Also Gordon could have bumped and re-routed that seam WR closer to Woolfolk, who had the deep 3rd responsibility. Two youngsters, two mistakes. But you gotta love that the coach takes the responsbility without directly calling out his players.